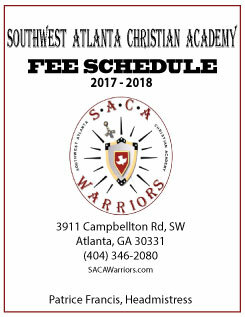 To see Southwest Atlanta Christian Academy's sample Tuition Fees, click the Fee Schedule icon to the left. If you have questions about current 2017-2018 Admission, Testing, Tuition/ Fees, Open Houses; or if you would like to be on our mailing list please call (404) 346-2080. We would love to have you join our SACA family!